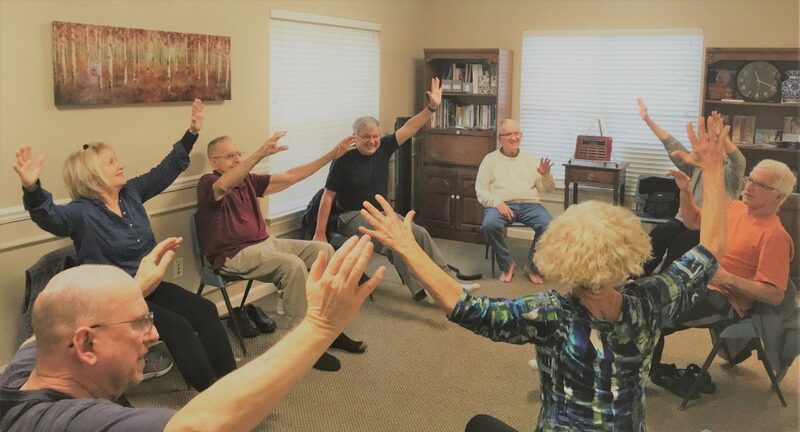 Join Marghi McClearn, owner of Marghi’s Joy and certified Ageless Grace® instructor, every Friday from 10:30 – 11:30 a.m. at the Parkinson’s Outreach Association’s office in Tallahassee for a fun, playful exercise class utilizing the principles of Ageless Grace®. Ageless Grace® is a cutting-edge brain fitness program based on the science of neuroplasticity, which activates all five functions of the brain – strategic planning, analytical thinking, kinesthetic learning, memory/recall, and creativity and imagination – while simultaneously addressing all 21 physical skills, or Tools, needed for lifelong optimal function. Ageless Grace® is ideally suited to Parkinson’s disease, as it addresses cognitive function as well as functional mobility. Additionally, this program is widely used to address dementia and apathy issues. By practicing Ageless Grace®, a Parkinson’s disease patient can enhance attention span, increase levels of working memory, and speed up the brain’s processing power, thereby stimulating healing and improving movement disorders. The easy-to-learn Tools promote the ”Three R’s” of lifelong comfort and ease: our ability to Respond, React, and Recover efficiently and safely. Our focus is on improving your brain and body through exercises that stimulate the release endorphins and dopamine, as well as engaging the entire nervous system. The benefits include improved cardiovascular health, joint mobility, spinal flexibility, balance, right-left brain function, and stress reduction. Practicing Ageless Grace® in a group setting can increase confidence and self-esteem. The 21 Tools have vivid, easy-to-remember names and include imagery, creativity, playfulness, variety, polarity, sound, expression, words, and games. Ageless Grace® is considered the “Feel Good, Brain Boosting, Body Enhancing” workout that feels more like play than work. With names like “Juicy Joints,” “Rockin’ Rockettes,” “Spaghetti Spine,” “Saving Grace,” “Grab Bag,” and “Power Tools,” you can’t help but get excited and have some fun! Contact the POA at (850) 364-0230 or contact@theparkinsonsoutreach.org for more information.